SDL announced today the launch of the LSPZone, an online directory of translation agencies who support Trados/SDL products. While I like the idea of having such a site, the execution of the agency search engine is downright painful. As it stands now I just don’t see many clients using it more than once. 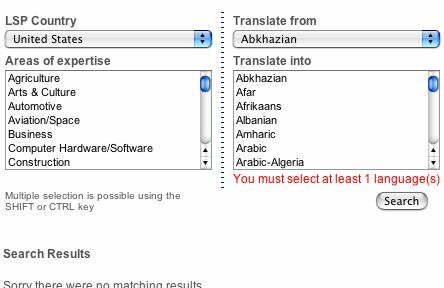 So I have to enter pull-down hell again and select a source and target language. But let’s say I’ve got a dozen language pairs to cover or let’s say I just want to quickly find out what agencies are listed in my country. It’s as if the search interface is in “advanced” mode automatically. What I’d like to see is a “simple” mode that allows for single-field searching. Will The Economist Become Too American?